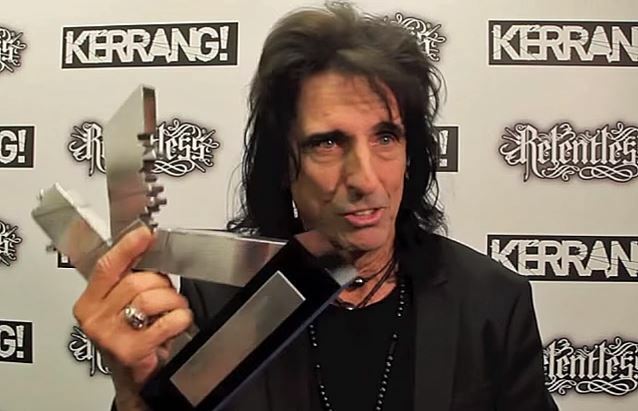 Alice Cooper was honored with the "Legend" award at this year's Kerrang! Awards, which were held Thursday night (June 11) in London, England. The ceremony took place at Troxy, where JUDAS PRIEST was also handed the "Inspiration" prize. Speaking to Kerrang! after the event, Cooper dedicated his award to legendary actor Sir Christopher Lee, who died earlier this week at the age of 93. "Christopher Lee was, like, an inspiration to every total rock guy out there," Alice said (see video below). "He was the best. Him and Vincent Price; we worked with those guys. I got to work with Vincent Price, and I knew Christopher Lee on a lot of diferent levels. We tried to do some songs together, but never quite got it together. But he was really a rocker. I mean, the guy was doing heavy metal albums. That's pretty hip." Sir Christopher Lee last December released released his latest heavy metal single titled "Darkest Carols, Faithful Sing". The single was a playful take on the Christmas classic "Hark! The Herald Angels Sing" and included three different mixes of the song. Christopher Lee became the oldest heavy metal artist at the age of 91. At Christmas 2013, the song "Jingle Hell" reached No. 18 on Billboard, making him the oldest performer in history to have charted. The record was previously held by Tony Bennett.